The disclosure relates to stent detection and shadow detection in the context of intravascular data sets obtained using a probe such as, for example, and optical coherence tomography probe or an intravascular ultrasound probe. St. Jude Medical was acquired by Abbot in 2016. St. Jude develops medical technology and services that focus on putting more control into the hands of those who treat cardiac, neurological and chronic pain patients worldwide. St. Jude Medical is headquartered in St. Paul, Minnesota and has four major focus areas that include: cardiac rhythm management, atrial fibrillation, cardiovascular and neuromodulation. 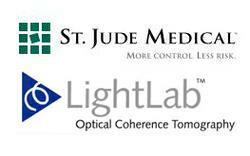 St. Jude acquired Lightlab Imaging in 2010. Lightlab makes intravascular OCT imaging products. We are pleased to add this new growth platform to our cardiovascular business, especially in conjunction with our FFR platform, and we are excited by the many opportunities this acquisition creates for St. Jude Medical and LightLab, physician customers and their patients...We welcome LightLab and its employees to St. Jude Medical. We are excited to join with a partner who shares our vision of improving patient outcomes and reducing health care costs through solutions which enable physicians to make earlier and more accurate treatment decisions... We believe St. Jude Medical's U.S. and international footprint, along with its existing FFR measurement technology, will accelerate growth for our industry-leading OCT technology. We look forward to joining the St. Jude Medical team. St. Jude Medical's acquisition of LightLab confirms the validity and potential utility of this leading edge technology...We are planning a best-in-class OCT solution. We currently have CE Mark in Europe on our first generation platform, and we are targeting a release of our second generation platform in Europe early next year. We anticipate that this system will incorporate a smaller catheter, shorter prep time, faster pullback speed, and a longer imaging segment than the current device.